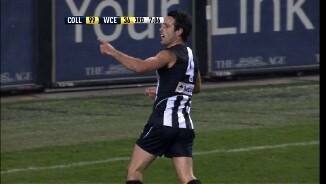 In 2014, Brodie Grundy will trade in No. 35 for Alan Didak's old No. 4. The player who is voted Collingwood's best and fairest player is awarded the E.W. Copeland Trophy. Who will win the Jock McHale Trophy? Read up on a history of the Jock McHale Trophy ahead of Friday night's Copeland Trophy Dinner. After an injury-hit 2011, the creative forward/midfielder was hoping for a change of luck in the pre-season but failed to get it when an adductor tear struck him down in February. The injury lingered and kept him from playing until round seven, then he was cut down by a full tear of the muscle in round 11. Missed a further seven games, and while he started to show touch towards the end of the season, he missed the Preliminary Final with a calf strain. Needs a big pre-season if he is to recapture his 2010 form. Struggled to make his usual impact, failing to hit the scoreboard after Round 12, and being used as the substitute on a number of occasions. Lacked his usual zip, and will be looking to return to full form and fitness in 2012. 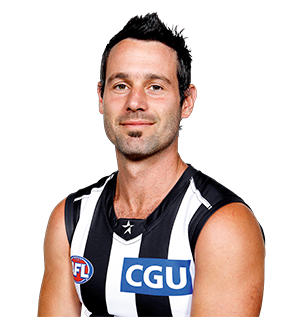 Capped his tenth season at the club with a vital role in Collingwood’s 15th premiership and selection in the All-Australian team. Didak was a consistent force throughout the year, leading the goal kicking (41) and snapping the sealer in the Grand Final Replay. Played the final five matches with a torn pectoral muscle. Bounced back from an indifferent two years to finish fifth in the Copeland Trophy, and was considered unlucky to miss out on an All-Australian guernsey. Rated best on ground by the umpires in Rounds 12, 13 and 15, but had a quiet finals series. Was solid, if not spectacular, for the first 18 weeks of the season, peaking during a mid-season purple patch (best on ground in the 86 point win over Geelong in Round Nine). 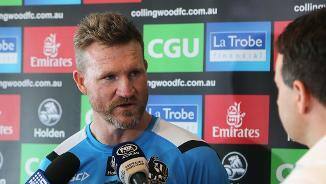 Was suspended by the club for the rest of the season after Round 18 after an off-field indiscretion. Had a delayed start to the season after knee surgery. Hit form quickly with seven goals in his first two games back but struggled for consistency thereafter. After a brush with strife off-field, Didak enjoyed a superb finals series. Was one of the best afield in the extra-time win over West Coast. Flashes of brilliance finally blended with consistency as Didak took out his first Copeland Trophy. Playing as a high half forward, he led the goal kicking (41) and played in all 23 games (going goalless in only four). Was named All-Australian for the first time as a half forward. Never got going due to injury and illness. Missed the first month with a knee injury, and the last month with a heart condition. Dominated against Geelong in Round 11, kicking five goals and winning 16 disposals. Kicked four the week prior against Hawthorn. A patchy season in which he earned his first two Brownlow votes following two goals and 22 disposals in Round 14 against Hawthorn. Missed a month with a broken jaw late in the season, and was one of the best in the Anzac Day loss (three goals and Mark of the Week). Toured Ireland with the International Rules team. Sounded a warning to the competition with five goals in the Wizard Cup fixture against Carlton. Booted 36 goals for the season, including two match winners from the boundary line against Brisbane in the Qualifying Final. Managed three majors in the Grand Final loss three weeks later. Broke into the side in Round Four and missed only three more matches. Received a Rising Star nomination for his five goals in the Round 19 loss to Hawthorn. Kicked a goal in the two winning finals, but was quiet in the Grand Final loss to the Lions. Goaled with his first kick against the Kangaroos in Round Seven, but managed only four more games for the year. Blessed with skills like no other, Didak is one of the most unique footballers the game has seen. Regularly conjures miracles out of nowhere in attack due to his creativity and deadly left boot. It often seems that the tighter the angle, the more likely it is that Didak will thrive. Has put in some accomplished performances in the midfield, but the half forward line is his home. Generally produces when it matters most, and will be looking to quickly rebound from a below par 2011.